Hanuman is a Hindu god and an ardent devotee of Rama. Hanuman was the son of Anjana, an apsara cursed to take the form of a monkey, who married Vanar (monkey) king Kesari. Birth story of Lord Hanuman is very fascinating, for that lets first read the story of Mother Anjana long before Lord Hanumans birth. Dasrath doing havanAt that same time King Dasharath was also performing the ritual of Putra kamana yagna (spiritual ritual in order to have children) in Ayodhya. As a result of that yagna, he received a sacred pudding (Kheer) to be shared by his three wives, leading to the births of Lord Ram, Lakshman, Bharat, and Shatrughna. While Dasarath was giving that prasad to his wife,a kite snatched a fragment of that pudding, flew over the forest and dropped it where Anjana was engaged in meditation. This all happened because of Lord Shivas boon. Lord Shiva commanded Vayu to deliver that prasad to Anjana. Vayu, the Hindu deity of the wind, delivered the falling prasad to the outstretched hands of Maa Anjana. Thinking it to be prasad from Lord Shiva, Anjana consumed it with delight. As a result,Hanuman was born to her and she was free from the curse of Sage Agnirasa. Kesari and Anjana were was very happy to see their monkey faced baby boy. 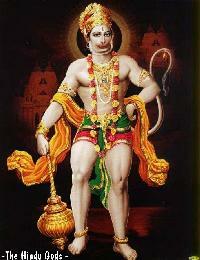 He was named as Anjaneya or the son of Anjana. Hanuman was very intelligent and proficient in grammar and music. He was a ardent worshiper and devotee of Ram and believed in devotion and sacrifice. Exciting events from Hanumans life are presented here in simple and lucid language for children. 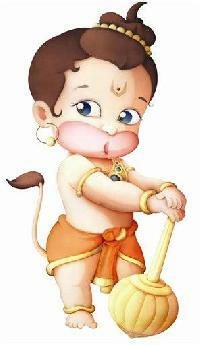 As Hanuman was a child of both Shiva and Vayu, he had immense power and was very strong from other monkey children. As compared to other monkey kids Hanuman was very curious and very mischievous. We would like to share some of his childhood stories. When he was a child, his mother, Anjana, had assured him that he would never be destroyed and whenever he feels hungry he can have fruits as red and ripe as the rising sun. There is a story behind it and a phrase from Hanuman Chalisa dohaBal samay rabi bhakhshi liyo meaning In his childhood Hanuman swallowed the sun; describes it well. Brahma blessed the monkey child with immortality, invulnerability, enduring devotion to God, and prowess (bravery). Agni blessed him, Saying, Fire will never burn you. Kaal was no less generous, May not death overcome you. Vayu blessed him with more speed than he himself had. Indra said, No weapon of any kind shall wound you or hit your body and since your chin(Hanu) was broken as a result of my hit so from today on you will be known as HANUMAN one with the broken jaw. All the gods,blessed him saying that, None will ever equal you in strength and speed. Surya gave him two siddhis of yoga namely laghima and garima. With laghima he could attain the smallest form and with garima he could attain the biggest form of life.It is from this event that Anjanas monkey son came to be known as Hanuman. After this Vayu, wind god started flowing like before and life in all three worlds were back to normal. Hanumans childhood was full of mischief and pranks. He was full of great energy and used his great powers to play pranks on meditating rishis. Hanuman disturbed them by pulling on their hairs, disturbing them in their puja and taking away their puja things. At first the rishis tried to ignore him but later they were very tired of his powers and decided to punish him by placing a small curse on Hanuman.With their powerful vision the rishis knew that Hanuman is a Hanuman lost his powersdivine child and later in his life he would assist Lord Ram in his quest to bring back Mother Sita from Lanka.They cursed him that for a short while Hanumann will loose all his powers and would remember only if someone would remind him of it. The effect of curse was lifted when a wise monkey named Jambhvant reminded Hanuman of his powers and this is when Hanuman recollected all his great powers and took a big jump to Lanka to find Mother Sita. 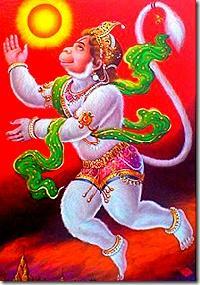 As Hanuman grew up he completed his studies under the guidance of Sun god. On completion of his studies Surya god asked him to help and guide Sugriv (who belonged to Surya gods family) throughtout his lifetime.Hanuman promised his guru that he will always accompany Sugriv and protect him from all harms. After seeking blessings from his guru Hanuman returned home to his parents. Later in his life Hanumans father King Kesari asked Hanuman to go to Pampapur to attain political knowledge, this is where Hanuman met Sugriv, the younger brother of Bali. They became good friends and later Hanuman assisted Sugriv during his tough days when Bali,his older brother had banished Sugriv from his kingdom. Sugriv sought protection in Matang Rishis ashram in Rishiyamukh mountains. He started living in those mountains with Hanuman and other vanars (monkeys). Hanuman was a friend and trusted advisory of Monkey King Sugriv. Sugriv was living in exile because of his brother Bali. One day he saw two young bowmen wondering in the foothills of Rishyamuk mountains. Fearing that Bali may have sent them to kill him, King Sugriv asked Hanuman to get their identity and on his orders Hanuman disguised himself as a Brahmin to get the details of these two bowmen. 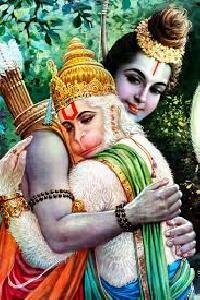 On seeing these two brothers Hanuman bowed and asked, Lord who are you and what bring you here? 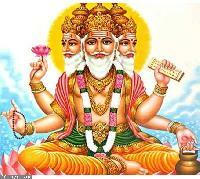 Seeing you it looks as if you are the Trinity either Brahma, Vishnu or Mahesh? All the Vanar sena (monkey soldier), Hanumanji, Angad and Jambhavant started looking for Mother Sita in every direction. But their search yield no result and they all sat by the ocean all distressed. Then Hanumanji met Sampati whose brother Jatayu was killed while he was trying to stop Mother Sita from being kidnapped by Lanka king Ravan. 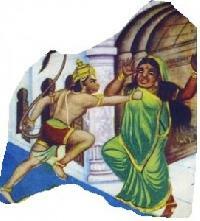 Sampati told Hanuman that he could see Mother Sita in Ashokvatika in Lanka. Now jumping the huge ocean was a task. Everyone was standing on the coast overlooking the ocean, and were worried as to how they can cross such a mighty ocean.At that instant, Jambhavant remembered about Hanumans lost powers.He said,I can cross this ocean but to make a comeback would be tough for me as I am old now. But Hanuman you can do it. He then reminds MahaveerHanumanji about his childhood mischief and how he was cursed. Hanumanji took a leap and his size was as big as Mahendra parvat.He took a big leap and started flying over the sea.He looked like as if a giant mountain itself is flyng across the sky. The sea asked Mainak Parvat to come out of the ocean bed right in front of Hanuman so that he can take some rest on you.As a result of a punishment* Mainak Parvat remained submerged in Mainak Parvatocean but on the command of sea it came out of the water and asked Hanuman, O lord, I am Mainak Parvat, I am here to serve you. Please take rest on me for a little while. I have brought you some delicious fruits.Come and sit on me *I have a story to tell you. In earlier times mountains had wings and they could fly as they please. As a result of which many animals and birds would get crushed under us. Seeing this Indra cut off all the wings with his thunderbolt but I was saved by your father Vayu dev. He was kind enough to blow me into the ocean otherwise Indra would have cut off my wings too. Hanuman was in no mood to listen to any stories. He said,Please forgive me Mainak,I am in a hurry and I cannot rest on you. Saying this Hanuman continued on his journey to Lanka. By now devtas understood that Hanuman is unstoppable but they still wanted to test him so they asked Naagmata Sursa to test his valor and stop Hanuman midway. She grew taller and taller and transformed herself into a huge Rakshas woman and obstructed the path of Hanuman. Seeing a monster sitting in between his path Hanuman requested her to give him the path Sursa and Hanumanas he is on a mission to find Mother Sita. She replied,No one can cross the ocean without passing through my mouth. Come into my mouth. Saying that Sursa opened her huge mouth. Sursa paid no heed to Hanumans repeatedly request. Hanuman then said, Open up your mouth so big that I can pass. In delight, Sursa started to open her mouth wider and wider. In comparison to her mouth Hanumaji started to grow bigger and bigger. By now Sursas mouth was several times bigger than Hanuman.This is what Hanuman was waiting for, he shrank his size to that of a small mosquito and before Sursa could match up to that size Hanuman entered her large and ugly mouth and quickly slipped out of it. Sursa was very pleased with Hanumans quick thinking. She blessed him and Hanuman was on his way to Lanka. After seeking blessing from Sursa Hanuman continued on his journey. Soon he realized he couldnt move, to his surprise his shadow was trapped in the clutches of a sea demon named Simhika. 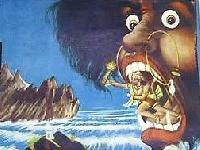 Hanuman then saw an ugly creature rising form the sea. She was a ferocious looking demon, black as a coal and a huge belly. These creatures kill their prey by grabbing their shadows. He had heard from King Sugriv about this creature one who grabs hold of anyone by their shadows.He thought to himself that he should get rid of this trouble soon to avoid further delay. Seeing Hanuman, Simhikas Simhikas meetmouth started to water she opened her wide mouth. It was so huge that her opened mouth touched the sky. Hanuman thought to defeat a monster this size I should enter her stomach and kill her. Without wasting any minute Hanuman shrank to his tiniest size and entered her mouth. Inside Hanuman went on a rampage and started clawing her organs with his sharp fingernails. Gripped by pain, Simhika opened her mouth with a loud painful howl and Hanuman jumped out of it. 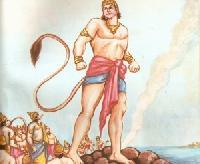 Once out, Hanuman resumed his original form and started hitting Simhika with his mace till she dropped dead in the sea. 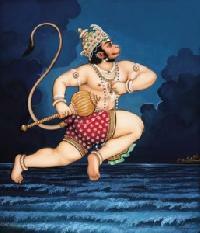 Hanuman resumed his journey and soon he spotted lush green trees along the seashore. He was sure that he has reached Lanka. He was still in his gigantic size and to avoid any more troubles Hanuman shrank back to his tiniest form. He set himself atop of Trikut Parvat (mountain) from where he could get a good vision of Sone Ki Lanka Golden city Lanka which was situated in Trikuta Hills. This city was build by Vishwakarma the architect of gods and it was not only beautiful; it was guarded and protected well from all sides. Ravans Lanka had four entrance doors, located in each directions and were heavily guarded. Hanuman had no intentions of getting caught by the rakshas so he waited till it was night time to enter the city. Hanumanji entered Lanka through its northern gate. To observe the city more closely Hanuman reduced to a size of a thumb. Hanuman was very angry at Lankinis response and since she was a woman Hanuman just slapped her with his left arm and that slap was enough to knock Lankini down. Have mercy on me O lord! I know who you are. I remember Brahmaji telling me that when I will be defeated by a Vanar consider from that day forth Lanka will be on the verge of destruction. Since King Ravan has brought Mother Sita to Lanka, Lanka has lost its charm and I know that Lankas doomsday is near, cried Lankini. She continued sayng, O vanar, welcome to Lanka and you may go wherever you feel like, may you find Mother Sita soon. Hanuman resumed his tiny form and entered Lanka.